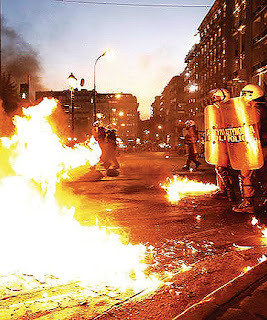 So much for CNN claim that there are "peaceful protests" at the Greek parliament attended by a "few hundred protesters"
Clashes have erupted outside the Parliament in the Greek capital. Police have deployed pepper spray and tear gas against protestors hurling Molotov cocktails and rocks during an anti-austerity rally attended by thousands. Riot police used pepper spray and tear gas to suppress a large crowd of people, who began hurling Molotov cocktails and rocks at police officers. Earlier, police estimated the number of anti-austerity protesters at Syntagma Square at about 12,500 people. 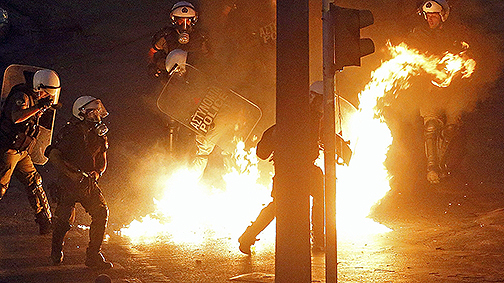 The clashes broke out as the Greek parliament began to debate an austerity bill requiring consumer tax increases and pension reforms. 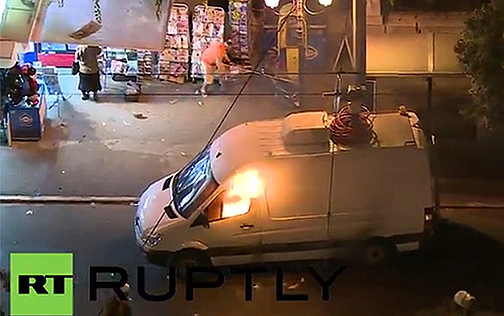 A journalist was shot in the leg during the scuffles, Skai TV-channel reported. RT’s Daniel Hawkins also reports spent gas and stun grenade canisters littering the square in front of the parliament. Some 50 protesters have been detained, according to AP. Media say the protesters behind the clashes are anarchists. They were protesting against a new bailout deal with European creditors which, if passed, will lead to a series of reforms bearing heavily on the Greek economy. Greece is already suffering from an unemployment rate of 25 percent. 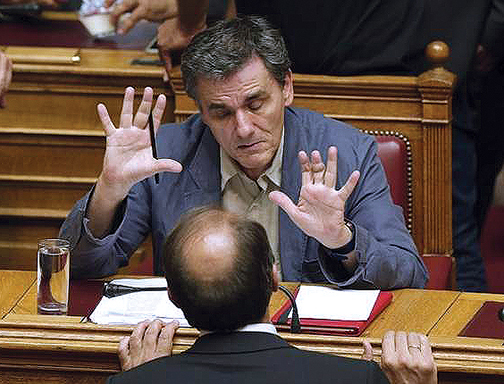 Finance Minister Euclid Tsakalotos, though defending the bailout terms, said that Monday, the day the agreement was announced, had been “the hardest day of his life,” Reuters reported from the Parliament. Syriza MP Dimitris Vitsas said that he didn't want "to speak in favor of the bill but about the necessity of passing it." About 30 to 40 members of Prime Minister Alexis Tsipras' left-wing party Syriza are expected to vote against the legislation. Tsipras accepted the bailout deal this week during negotiations in Brussels thus escaping for now the possible ejection of the country from the eurozone. Now, Greece faces a deadline for €3.5 billion payment to the European Central Bank on July 20, having already missed two deadlines. 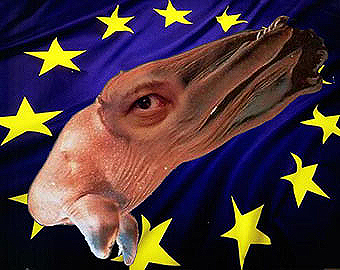 European finance ministers have proposed a €7 billion loan from the European Financial Stability Mechanism. "I am reluctant to say this, but I hope the Greeks burn it all down- for the good of all of us, for the good of our children and children's children. I am old enough to remember when times were different, when times were better for human beings. Yes, back then we had to work, and work hard too. But, there was time for family, to be with the kids. Back then it wasn't all about the money, the amount of production that could be squeezed out of a person. It gets worse every year. Now it's all about work and more work so you can get some sleep so you can work more, longer, harder." - Juan, commenting on AFP.